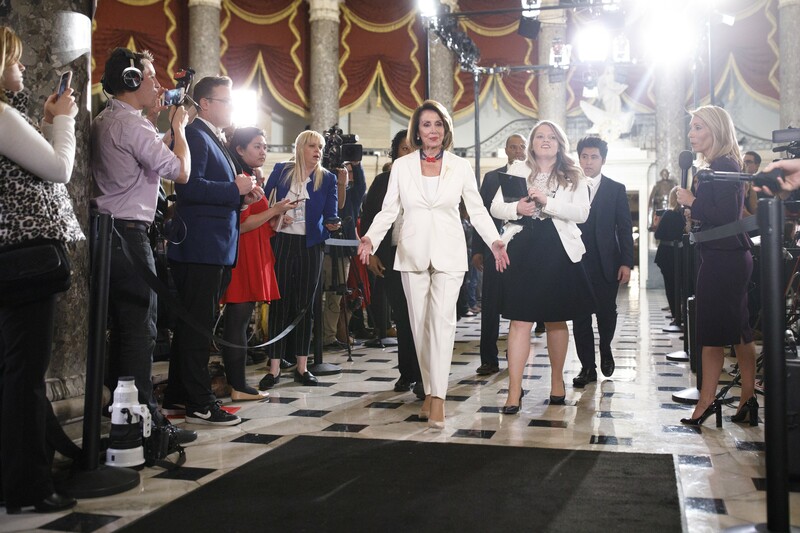 House Speaker Nancy Pelosi (D-Calif.) after the State of the Union address at the Capitol on Tuesday night, Feb. 5, 2019. A defiant Pelosi declared on Wednesday that House Democrats would not be cowed by President Donald Trump’s “all-out threat” during his State of the Union address to drop their investigations of his administration, as fellow Democrats pushed ahead with a bevy of sensitive inquiries. WASHINGTON — Democrats took the first cautious steps on Thursday in their quest to obtain President Donald Trump’s long-hidden tax returns, further inflaming the contentious relationship between the president and the newly empowered House. A fractious afternoon hearing of a House Ways and Means oversight subcommittee was intended to begin building a case that Trump’s withholding of his returns was not only flouting modern political norms but also potentially hiding violations of federal tax laws and compromising the interests of the United States. Democrats argued that they had the legal authority and good cause to invoke an obscure provision in the federal code that gives the committee’s chairman access to private tax information to find the answers and potentially inform other related inquiries into Trump’s financial positions. Tensions have also simmered between Democratic leaders who want to proceed slowly and liberals who think they are wasting time. But by the time the gavel fell in the Ways and Means hearing room, the Democrats had already made clear they were undeterred. What comes next is far less clear. The statute in question — Section 6103 of the federal tax code — gives the chairman of the Ways and Means Committee extraordinary powers to request that the Treasury Department release to him tax information on any filer, including the president. The provision allows the committee to review the tax information privately, but it would have to vote to disclose any return information or findings to the public.